I’m making strong progress with the book today: I’ve completed the section around the Socially Dynamic Organisation, and have moved onto look at the foundations of change. 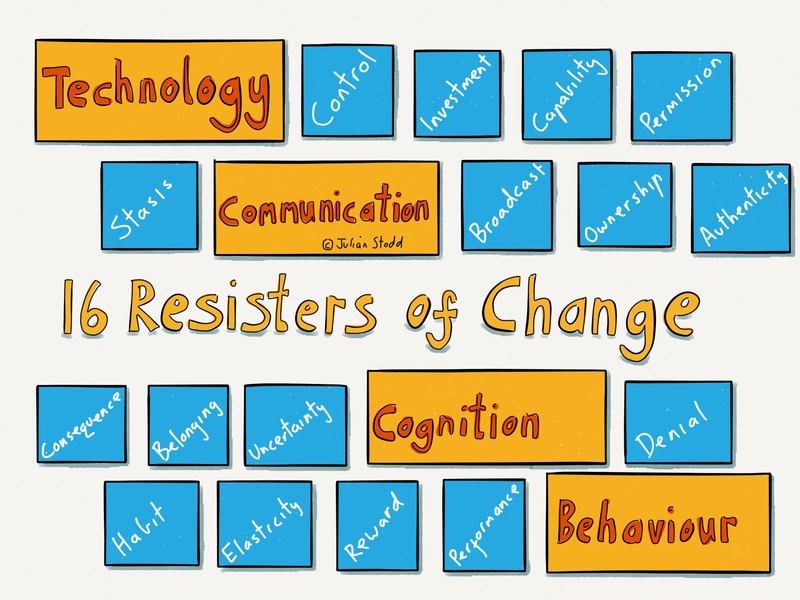 Today I’ve been writing primarily around the 16 resistors of change, which are grouped into aspects of technology, communication, cognition, and behaviour. When I’m doing dedicated writing on the book, I like to #WorkOutLoud and share sections as they are completed. Today I’m sharing four sections, all around the ‘technology’ aspect of resistance: it covers organisations that control to heavily, ways that investment can be a barrier to change, how capability can be an issue, and the importance of permission. My usual caveat: this is live writing, so not yet proofed, and not yet complete, but shared as work in progress. Whilst I have previously shared the overview chapter on the 16 Resistors of Change, all the work shared here today is new. Let’s consider the four Resisters of change that relate to technology. Traditional organisations accumulate infrastructure: buildings, furniture, vehicles, tools, and technology. The trappings of power and success. These formally held assets are not simply physical, but come with associated rules and conditions: we are mandated to treat them in certain ways, there is often an underlying assumption that we are privileged to have access to them, and the ways that we treat and utilise them are governed and controlled. A big shift in the Social Age is that technology has become democratised: in the old world infrastructure was complex and expensive, it made our lives easier to be in an office where we had access to printers, file storage, the Internet, and computers, but today, that infrastructure is everywhere, is duplicated, is free, and is democratised. In our own homes, or in our own bags, we have access to connectivity and creativity that was hitherto unheard of. And yet while the ecosystem of technology has changed, organisational attitudes towards it, and specifically towards the control of it, have not changed as fast. Where organisations have permitted people to use their own technologies, it is often still positioned as a favour, or has come about as a cost saving measure for the organisation, rather than in any true belief that individuals are possibly getting better at organising their ecosystem of productive technology than the organisation was ever able to. This is reflected in some of the research I’ve been doing recently around the Landscape of Trust,[ ref to the blog] where the initial results suggest that individuals trust formal technology less than technology which they own themselves. This trust appears to relate to ownership and control: technology that we own ourselves, we have greater control over, and that leads to higher trust. The shift in a Socially Dynamic Organisation is likely to be one from control to facilitation: instead of seeking to own the spaces and technologies through which people are creative or collaborate, these organisations will seek to enable. Certainly they will provide formal technologies, spaces which are safe and controlled, spaces for sensitive conversations, spaces with privileged access to information, but most likely they will also have spaces for more socially democratised and collaborative engagement. Trying to own and control all the spaces most frequently leads people to simply subversively engage out of sight. Controller is expressed in many ways: part of it may be where we tell people which system to use for specific things, rather than focusing on the quality of outcome that we are looking for. We may tell people that they must collaborate using Skype, and that they are not allowed to use other collaborative platforms, and yet we fail to ask how this fosters collaboration. In reality, the Socially Dynamic Organisation will worry less about its ability to control which platforms people collaborate on, and will focus far more on developing Social Leadership capability in collaboration itself. In other words, an adapted organisation will focus on effectiveness and capability, rather than attempting to micromanage and control which technology is used to do these things, a question which the community is more than capable of taking care of for itself. Are there risks around technology? Absolutely. And yet often IT and HR move beyond simply managing risk. They move into areas of control that are simply not needed and are often, indeed, simply ways of justifying their own existence and reinforcing their hierarchical power. This type of power based control is directly counter to a mature and respectful Socially Dynamic Organisation. This is not an incidental issue, it sits at the heart of the challenge, and refers back yet again to the notion of a holistic pattern of adaptation: we cannot adapt the organisation in pieces, we have to adapt the whole thing. We need an IT entity which is facilitating and enabling, along with an HR entity, senior leadership, recruitment, and so forth. If we only adapt part of the organisation, other aspects will work against the change. We will remain Resistant, or at best Constrained. We have to help these different parts of the organisation find their strength in being enabling and facilitating. For as long as they find their strength in controlling, they will sit in opposition to the community, and hence we will fail. The controlling nature of technology, and indeed the temptation to control with technology, is often founded upon technical features. For example, many organisational social collaborative technologies include the technical ability for asynchronous moderation of comments and posts, and hence organisations end up moderating comments and posts. But moderation is experienced as the formal application of ownership and power, and lack of trust in the community. Furthermore it does not silence dissenting conversation, but simply moves it into democratised spaces that are out of our earshot, so we lose twice: we lose the ability to contribute other views, and we lose the ability to hear the wisdom of the crowd. To overcome this aspect of resistance requires a change in mindset and behaviour. It requires a new attitude towards technology, and indeed a new attitude towards risk, although we should not believe that this is simply about taking on more risk. It’s actually about getting access to greater expertise and engagement. Relinquishing control actually gives us greater access to the community that may help us to avoid future risk. In a socially connected and technically connected world, our ability to control messaging, our ability to own stories, is significantly degraded, and this is a good thing. We need to find ways of being safe that rely not simply on formal control, and technology is often experienced as the most easily applied and most formally mandated mechanism of control. To change, we will need to find new ways of being safe, ways that are based on deeply engaged communities, and high levels of trust between senior leadership, managers and leaders, and an engaged community. This will not be applied off-the-shelf using a feature of technology. •	We need to move beyond control, beyond the notion that the organisation knows best. •	We need to maintain safe spaces which are well understood, safe technologies which the organisation owns, but also find ways to integrate more social technology, moderated by the community. •	We must move beyond simple mechanisms of control based on technology, towards mechanisms of responsibility founded upon trust. We all want good value for money: the challenge for an organisation in the Social Age is to evolve the ways that they find it. Historically IT systems were complex and expensive, and that may still be true for the heavyweight infrastructure systems, but a big change that we have seen is the emergence of new models of ownership, low-cost apps, subscriptions, freemium, and open source. Many of these sit in direct contrast to those older models. For example, many organisations are unable to understand the benefits of open source software, but also the responsibilities that come with it. They are used to the notion that to receive something you pay for it, and to benefit somebody else they pay you. They are not comfortable in a gift economy, or a mutually beneficial, co-owned asset economy. They see sharing as weakness or risk. We may still need heavyweight infrastructure systems, but many of the more social collaborative aspects of our work are done through much lighter weight technologies, ones that we pick up and utilise in a matter of minutes. Ones that are often very low cost or free. And crucially, ones that are highly disposable when we have tested them, or when they have been superseded. It’s important to differentiate conversations from technologies: conversations take place between people within communities, across many different technologies. We are primarily interested in great conversations, and technologies that facilitate them, hence the responsibility to allow those lightweight technologies to flourish, and to learn what type of ecosystem we may need to support in this new space. To give you an idea, even within my own organisation, we started collaborating on WhatsApp, moved on to Slack, and are now starting to focus on Google Hangouts. There was no strategy for this change, simply a gradual evolution of what was useful, and a willingness of the community to give it a go. The other day when I asked someone in the National Health Service in the UK, one of our biggest employers, what tool they preferred for collaboration, they just laughed at me, and said they were almost unable to use anything within their network. The next thing they said was typical: “but I can access Google Docs from my personal phone, and we can use that”. People work around the system. In terms of investment we may need budgets and budgetary controls around formal infrastructure systems, but we may need a second space, a much more lightweight and impermanent one, where we are able to acquire and prototype lightweight and disposable solutions. Not simply a budget to do so, but also a space and permission. I’m writing this book using a tool called Scrivener, a piece of software that allows me to layout the book with every section and chapter held in a separate document, but all linked within one file structure. As I look at the page now, I can see that file structure on the left, and see how the section I’m writing relates to everything else. I bought it on the recommendation of a friend who has himself used it successfully to write several books. So his reputation led me to try it out for myself, and I’m very grateful! It’s that ability to just try things out we should unlock: if we move on to adopt these technologies at wider scale, at that point we can start to worry about compatibility and integration. The reality is that maintaining the dream of connectivity and integration, maintaining an illusory idealised infrastructure, may be a fallacy. More likely, we need to develop the capability to manage diverse ecosystems of lightly interconnected technologies which have one core ability: to be rapidly disposable. To achieve this, we not only need an IT function with a willingness to enable people to test and prototype (rather than trying to hold that ability themselves), but we also need finance and budget structures that allow us to do so rapidly and easily. Just because something cost us a lot of money is not a good reason to hold onto it if it is no longer doing the job it needs to do. Similarly we should not be afraid of free solutions, even if they are less well supported and robust than expensive ones. Just don’t use them for anything business critical. Even my phone, a piece of hardware that was pretty expensive, I don’t expect to last much more than two years. The general move is towards more regular updates, and towards fluidity of the ecosystem of technology that we utilise. Our investment structures and controls must reflect this. •	Ensure that the IT function has a mindset and capability to control core systems, but to devolve responsibility and create spaces for the prototyping of lightweight social collaborative ones. •	Create budget structures that allow the low-cost rapid prototyping of new systems. •	Ensure a mindset where it is easier to dispose of redundant technologies then to procure new ones. Rather than one perfect system, have an ability to rapidly prototype and test. Actively consider where the organisation learns how to do new things. If we rely on a small number of people with deep specialist knowledge to do all the thinking, we will get good outputs, but within a known space. If we also include spaces for crowd sourced wisdom, inviting input from those who traditionally, within a formal hierarchy, may not be recognised for their deep expertise, we may find ideas from outside the known space. This is another example of why the Socially Dynamic Organisation is so strong, because it derives part of its strength from outside the system: it is permeable to expertise, able to hear wise voices wherever that wisdom is based. This is a capability that we need to develop: the reason that it is listed as a Resistor of change is that often the established capability in the organisation will resist either tacitly or explicitly, wisdom that comes from outside the group. This is the hardest aspect of change: for us all to find our pride in the ability to enable others to be successful, not simply to hold all the answers ourselves. What will we see when this is working? We will see people turning to IT when they have an idea, when they are able to think of new technologies that have been recommended to them which may be of benefit to the organisation, and in turn the IT team will welcome that input, and create sandbox environments and test spaces for them to utilise it. The only condition of the support will be that at the end of the experiment, the users and IT team all work together to write the story of what worked and what did not, building deeper tribal knowledge. We have to recognise many of the existing entities within an organisation are experienced as mechanisms of control. Many IT teams are truly superb, and yet still, time and again, we have a sense of dread when people have to bring something new to an overworked IT team. For as long as the technology arm of the organisation is forever running ragged trying to own and control, it will be deeply breathless and unable to truly support agility, so just as we need IT to adapt itself to be deeply facilitating and enabling, so to we need to adapt the expectations of the senior leadership and wider organisation to support it in doing so. It’s a two-way street, and as previously noted, the Dynamic organisation co-creates its answers. •	Encourage IT to consider how it can create the sandbox and prototype spaces, and how to invite input from the wider community. •	Consider more widely the pressure that IT is under, and how to evolve expectations of senior leadership and the wider community. •	Consider actively where the organisation learns about innovation, where it develops its technical capability, and ensure that that is more widely then simply within an IT team. Consider the fundamental attitude of the organisation towards permission: is it viewed as something that is granted by the organisation, or as something assumed within the community. Lack of permission, or fear of consequence that results from it, can be a strong feature of resistance. Simply being told we have a permission to innovate, or a permission to fail, is not enough. It’s the experience of it that counts. It’s very easy to talk about permission, but often from a paternalistic mindset where the organisation believes it holds the ultimate control. A Socially Dynamic Organisation does indeed maintain boundaries of permission, where certain people are allowed to do things, and others are not, but those permissions can be questioned and are fluid. Because circumstances are also fluid. Earlier we talked about how the oil tanker of the organisation, the mass and momentum that prevents it being agile, are in many ways engineered and accreted by the organisation itself. Permission is one such example: it’s easy to talk about a space where everyone is equal, we can experiment, we can be curious and inquisitive, we can be agile, but it’s much harder to actually achieve this, because permission can be lacking, and consequence is very real. •	Think carefully about how permission is viewed within your organisation. Is this good enough? •	Where possible, actively have conversations about permission, and seek to understand how it is lost in your unique organisation. Understand the role of consequence in this. •	Consider how much permission is absolute, and how much is fluid: what spaces do you truly need to protect, and which are simply protected as a matter of control. This entry was posted in Change, Writing and tagged Books, Change, Resistance, Socially Dynamic Organisation, Technology, WorkingOutLoud, Writing. Bookmark the permalink.